Litomyšl Fishing Company (Freshwater Fish Farming and Selling Ltd.) was founded in 1993 on the basis of privatization of the part of state Fishing Company Litomyšl. During the following years it was further extended and today the company manages 220 ponds, particularly in Pardubice region with a total area of 1100 hectares of water surface. At the same time there were made substantial changes in the way of fish farming in the ponds with maximum respect for the environment and water quality and utmost care given to the maintenance of the ponds as important landscape features. Ninety percent of annual production consists of the Common carp bred in manner consistent with organic food quality. Other additional fish species are represented by the Tench, the Silver carp, the Grass carp, the Zander, the Pike, the Catfish, the Coregonus fish species etc. The company also operates Salmonidae fish species (the Rainbow trout, the Brown trout, the Brook trout). A special programme is breeding of protected and endangered species such as the Burbot, the Common minnow and the Ide. The Grayling, the Chub, the Common barbel, the Asp, the Common bream, the Roach, the European perch and the Common nase are also bred for the stocking of streams, rivers, natural and artificial lakes for needs of fishing unions. The company owns a fish hatchery which ensures the reproduction of the main farm fish species, rheophilic and ornamental fish. A special project of crayfish conservation has been carried out for several years. The company contributes significantly to the revitalization of the landscape and environmental protection. In recent years it has increased the environmental value of more than 100 hectares of land by restoration of ponds, streams, and littoral wetland zones. It has been cooperating closely in professional activities with leading scientific bodies and universities in the country. The company provides year-round fish sales to wholesale and retail customers. The domestic market accounts for 80 percent of company´s production, approximately 20 percent is exported, mainly to Germany, Poland, Austria, Italy and other countries. The Fishing Shopping Center is opened for retail customers in Litomyšl. It consists of a live fish shop and a shop with fishing equipment Vit Šaroun, which is a separate business entity. In summer months angle fishing is organized on the company´s premises. 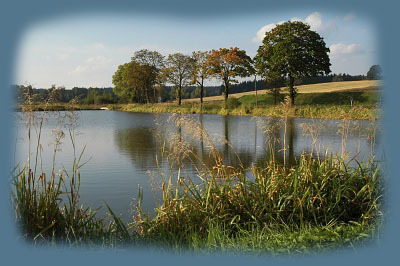 Annually from May 1 to October 15, four ponds for angling fishing are reserved for sports fishermen. They are ponds Budislavský Lower, Zimka, Strakovský near Litomyšl and Přívratský Lower near Česká Třebová. Anyone interested is allowed to fish on condition of possessing a purchased valid fishing license. The company also focuses on breeding ornamental fish such as the Koi carp, the Goldfish, the Crucian carp, the Golden orf, the Shubunkin goldfish.